Late last year we launched Azure Mobile Engagement, our data-driven user engagement platform that enables fine-grain user segmentation, app user analytics, contextually-aware smart push notifications and in-app messaging across all connected devices. Since launch, we’ve been working on some great new partnerships to provide extra value for all of our customers. We have an exciting partnership with VMob, an end-to-end personalization platform specializing in the retail sector, particularly for brands with a physical presence. The VMob platform integrates with the brand's smartphone app to continuously collect and store a range of real-time data including: location, movement speed, local weather and nearby events. VMob can then combine that real-time data with information on past transactions through its IoT platform to deliver a level of personalized content not possible with other media. We have been working closely with VMob and now they are using Azure Mobile Engagement under the hood. Today our customers can integrate both the VMob and Azure Mobile Engagement SDK in their mobile app to see immediate benefits. Learn more about the integration in article. 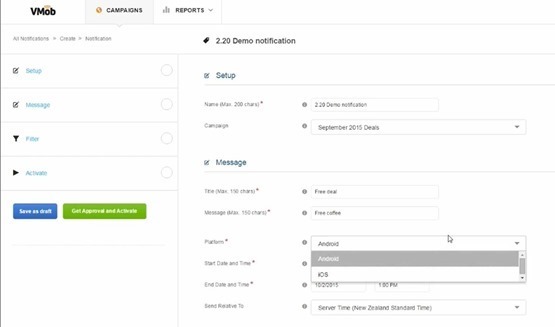 Customers simply use the VMob portal to create personalized marketing campaigns and then enable delivery of resulting notifications using the Azure Mobile Engagement SDK in the mobile app, providing a unified experience to customize and visualize push notifications.